The ceraunus blue butterfly, Hemiargus ceraunus (Fabricius), is a widespread Neotropical butterfly common in southern portions of the U.S. It is common in various open, sunny habitats including roadsides, fallow agricultural land, weedlots, utility corridors, scrubs, open woodlands, yards, and parks. Figure 1. Adult ceraunus blue butterfly, Hemiargus ceraunus (Fabricius). Photograph by Jaret C. Daniels, University of Florida. The ceraunus blue occurs across much of the extreme southern United States southward through Mexico, Central America and the West Indies to South America; occasionally strays northward. In Florida, it can be found in all 67 counties. It is common year-round in southern portions of the state. Adults: The ceraunus blue butterflies are small and easy to overlook. Adults have a wingspan range of 22 to 30 mm. The sexes are dimorphic. 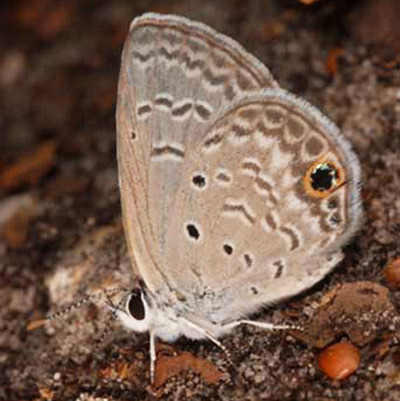 The upper surface of the wings is lavender-blue in males with a narrow black margin and a single black hindwing spot. Females are somewhat darker with blue scaling limited to the wing bases. The undersides of the wings are gray with dark bars, white bands and white-rimmed black spots. The hindwing has a prominent orange-rimmed black marginal spot. Larvae: The slug-like larvae are highly variable and range in color from light green to pinkish-red. Figure 2. 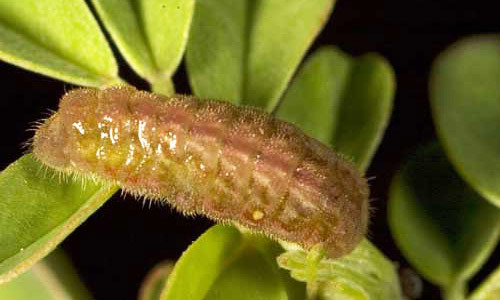 Green larva of the ceraunus blue butterfly, Hemiargus ceraunus (Fabricius), on indigo (Indigofera spp.) (Fabaceae). Photograph by Jaret C. Daniels, University of Florida. Figure 3. Red larva of the ceraunus blue butterfly, Hemiargus ceraunus (Fabricius), on indigo (Indigofera spp.) (Fabaceae). Photograph by Jaret C. Daniels, University of Florida. Pupae: The pupae are yellow-green. The ceraunus blue produces multiple generations each year. Adults may be found in all months of the year in southern Florida. Adults fly very low to the ground just above the vegetation. 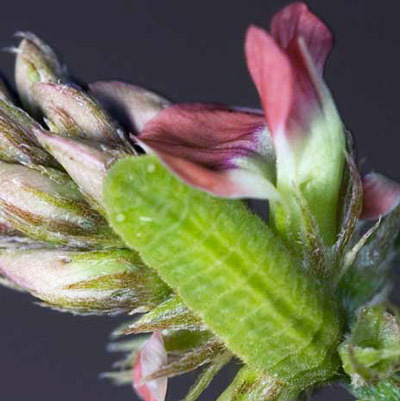 Females lay the small, somewhat flattened blue eggs singly on flower buds of a variety of herbaceous legumes. Larvae feed on the new growth, buds and flowers of the host plant. Hosts include a variety of herbaceous legumes: including rosary pea, Abrus precatorius L.; partridge pea, Chamaecrista fasciculata (Michx.) Greene; sensitive pea, Chamaecrista nictitans (L.) Moench; and indigo, Indegofera spp.. Publication Date: January 2008. Reviewed: January 2015.